my very good pal John Porcellino has been on the road for the past 5 weeks, traversing our great nation in celebration of the release of his new book "MAP OF MY HEART: selected comics 1996 -2002" (Drawn & Quarterly) and not only that but GET THIS: also marking 20 YEARS OF KING-CAT. i know, it's crazy. so, yeah; John has been doing his zine for 20 years, and it's pretty well agreed that King-Cat is perhaps the greatest mini comic, uh...ever. John has been HUGELY influential and i'm not even going to get into all that because i'd be up typing for another 2 hours, but it's a big deal (in a very quiet, small way). and John has said to me many times on the phone about the comics that make up "MAP OF MY HEART"..."they're the best comics i've ever done". and you know-- they ARE. and with someone like John, and a magazine like King- Cat, that's saying something. i'm not kidding, this is a VERY SPECIAL BOOK. 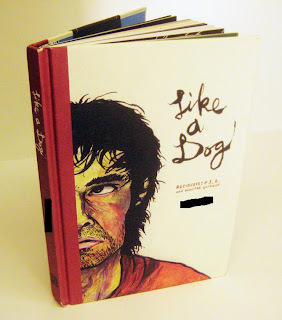 and not only that, but MY new collection of old stuff is coming out too-- it's called "LIKE A DOG", and it's a fancy hardcover book with a bunch of full color stuff in it, collecting the first 2 'zine issues of "Recidivist" as well as a bunch of other stuff i did for anthologies and whathaveyou, all decked out with extensive "liner notes". my pals at Fantagraphics were nice enough to publish the thing, and i've got to say-- i'm extremely proud of this book. i really am; it came out better than i could've possibly hoped. so it's a RELEASE PARTY FOR BOTH BOOKS!!! HOORAY!!! michael's puttin' it on, so we'll both be at BIG BRAIN COMICS (that's 1027 Washington Ave S Minneapolis, MN 55415 (612) 338-4390) signing and shooting the breeze from 5 til 7:30 or so on SATURDAY, OCTOBER 24.